From the dimly-lit cafes and humid dance halls of Paris in the 1940's. Fleur de Paris bring to life the romance and drama of Paris in the golden era of Chanson, Jazz and Swing. From the dimly-lit cafes and humid dance halls of Paris in the 1940’s. 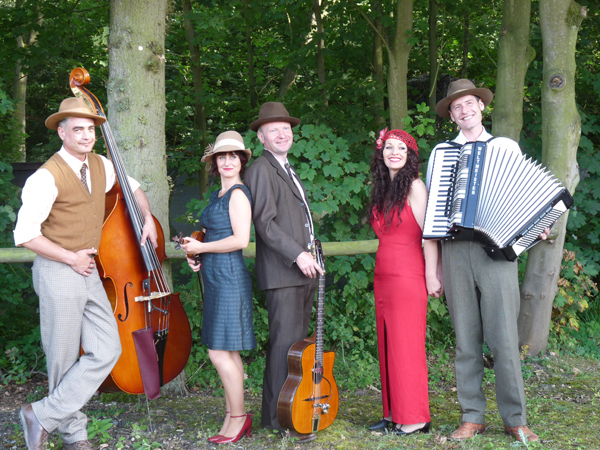 Fleur de Paris bring to life the romance and drama of Paris in the golden era of Chanson, Jazz and Swing. Featuring beautiful arrangements of classic French singers like Lucienne Delyle, Charles Trenet and Edith Piaf, and with a touch of the Hot Club sound of Django Reinhardt. The 5 piece band, led by charming French songstress Lo will transport you back in time. The accordion, violin, guitar and double bass authentically capture the orchestral magic and smooth cinematic jazz of wartime Paris. With over 10 years performing and a huge repertoire of waltzes, swing dance tunes and elegant ballads, they create the perfect backdrop to any occasion. Whether you require smooth background music or a vibrant centre-piece to an evenings entertainment, the music is carefully chosen to compliment the event and create the perfect atmosphere. Just a wee note of appreciation for supplying us with Buona Nota, and Fleur de Paris for MedFest 2012. Both sets of artists were superb and lovely to work with.